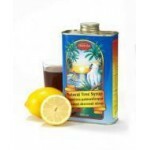 Madal Bal Natural Tree Syrup is the key ingredient for The Lemon Detox supplied by Pure Products Ltd. A blend of premium grade maple and palm saps it is rich in vital minerals and vitamins. When mixed with fresh lemon juice, water and a pinch of cayenne pepper it provides the body with all the nutrients it needs to support a fast, diet or cleansing programme. Benefits of practicing the detox are widely reported to include cleansing the body of toxins, weight loss, improved appearance of skin hair and eyes, and a renewed sense of energy and life.